Mellan modeveckorna i Paris och New York hade jag ett kort stopp hemma i Stockholm för att ta hand om mindre roliga saker som kemtvätt, sova mer än 5 timmar per natt och att faktiskt försöka njuta av lite ledighet. Hur det blev med den lediga biten låter jag vara osagt, men något jag gjorde första gången på väldigt, väldigt länge var att upptäcka Stockholm med cykel. När jag säger länge sedan så menar jag minst tio år och när jag först blev kontaktad av Otis Bikes från Götet blev jag smått nervös inför faktumet ifall jag överhuvudtaget kunde sitta på en cykel längre. Det var som bortblåst, då det stämmer att ifall man lärt sig cykla, glömmer man aldrig hur det går till. Där satt jag äntligen på en sprillans ny cykel. Även om jag älskar att gå runtomkring i mitt lilla Stockholm, så är cykeln i ärlighetens namn ett så mycket snabbare och smidigare sätt att ta sig fram på. 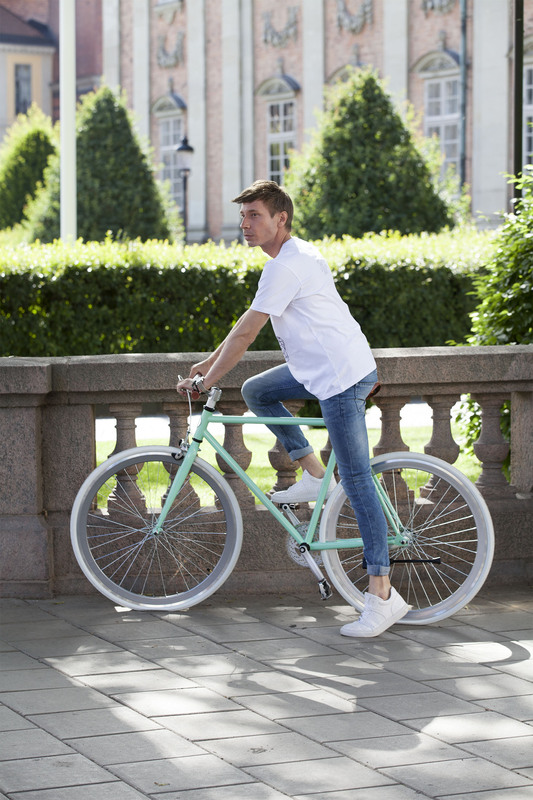 Otis Bikes kommer i tre färger, men då jag verkligen älskar pastelltoner var denna gröna pärla gjuten för mig. Om min lägenhet var snäppet större skulle jag faktiskt hänga den på väggen, både för att få till den där New York-känslan, men även för att den verkligen är vacker att se på. Jag uppmanar er alla som inte cyklat på ett tag att faktiskt upptäcka er hemstad, var ni än bor, genom att cykla. 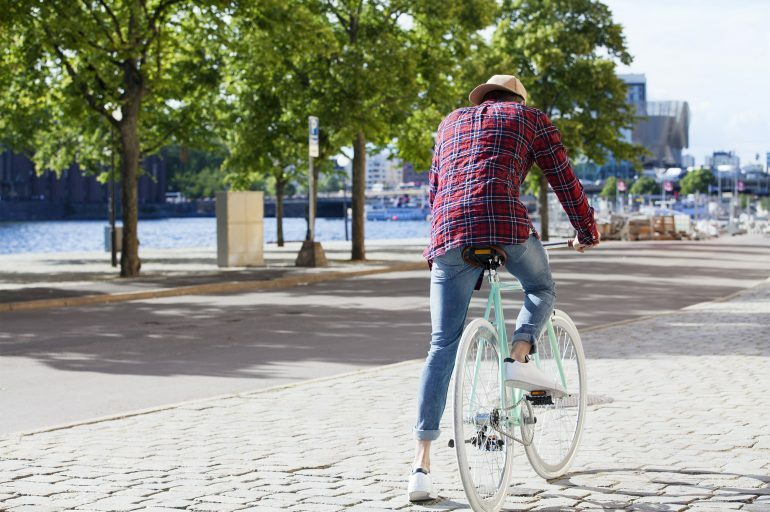 Cyklar är dock dyra, men Otis Bikes är både billiga och lätta att bära runt på vid behov då även en liten räka som jag klarar av tyngden. Dessutom är de vackra, inte att förglömma. Ta en titt på hemsidan och kolla vilken färg som är din favorit! Wow my darling… that mint bike is the burner. Exploring Stockholm… I did that also a while ago, when I spend 2 weeks there and basically fell in love with Sweden and Stockholm. Since then when I get asked: Which is ur fave country? I always say Sweden. U look like a champ riding that beautiful bike and I really get ur fear of getting on it after a long time. Since I always sucked in bicycling I think I won’t manage even to balance it out. What a truly delightful post! I absolutely love the design and variety available at Otis Bikes and I love this one that you choose. I can absolutely see why you would want to hang it on the wall! It’s gorgeous! 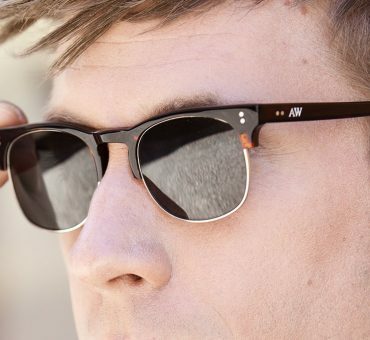 It’s great to find something so important and encouraging of a healthy lifestyle that is well made and also so stylish. I couldn’t help but notice, also, all the great fashionable outfits here. Really obsessed with the tee with the glasses ! Thank you so much for all this inspiration today! Ps. I wish I was bike riding with you now !!! OMG that bike is gorgeous! I love bike riding too. 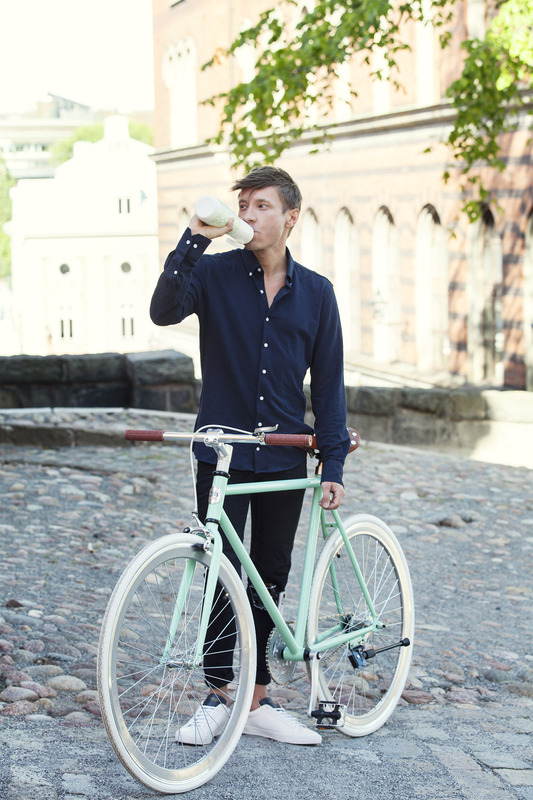 I do it here in NYC and when I was in Stockholm I spent the last day riding a bike all over the city! I totally love the color of the bike,and I probably would use it as a piece of decor too since I don’t know how to ride a bike..I enjoyed reading this post!!! What a chic way to explore your city! Chicago rental bikes definitely don’t look like this!! 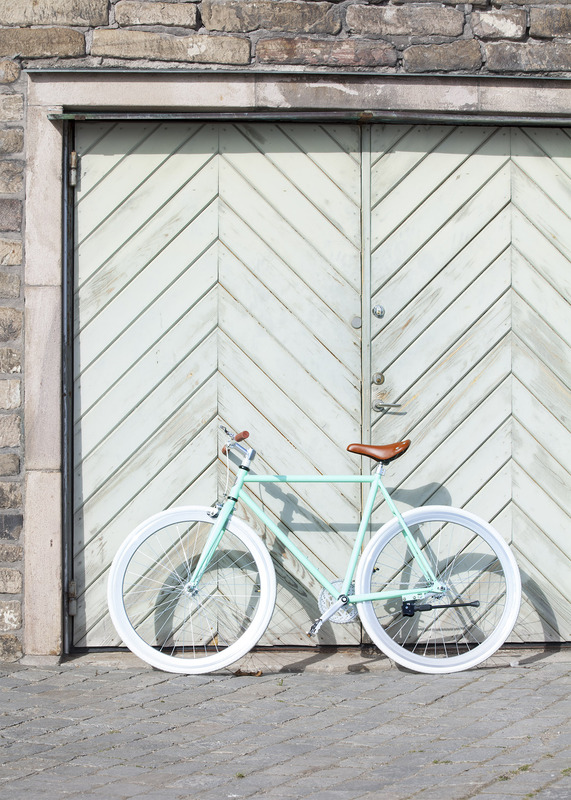 This pastel bike is so cool, I love the vintage vibe of it! Such a great idea to explore the city with the bike! I would love to visit Stockholm one day and take a ride. Love all of your outfits here! I love Otis Bikes! wow, they are so stylish and I truly adore pastel colors so you did an awesome selection with the mint shade. Riding bikes are one of the activities I truly enjoy the most. I haven’t done it for a while and you have inspired me to do it this weekend! :))) I’m happy always happy to read your posts. Now you’re talking my language! Riding mikes is one of my favorite pastimes!!! It’s like my therapy! 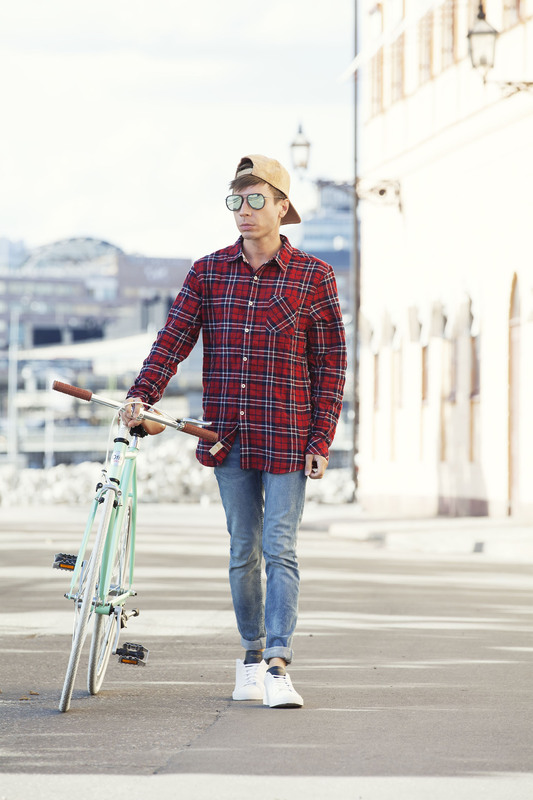 This bike really goes well with your style aesthetic. The color is very eye-catching! Exploring the city on bike is the. Eat way to enjoy it in my opinion! A bike is something I haven’t ridden in years myself, not counting the stationary bikes at the gym haha. I said when I moved to a larger, bike friendly city, I would get myself one for exercise and just to get from behind technology sometimes. Your post has inspired me to do just that! Otis Bikes certainly does have some pretty options to choose from! OMG that bike is gorgeous! I love bike riding too. I do it here in Paris and when I was in Amsterdam I spent the last day riding a bike all over the city! Love your work, keep it on rocking! OMG I love this bike. I need one!! I really want to get into biking more. I feel like it would be so relaxing. And this is the exact color bike I am looking for! i love getting on a bike and exploring! 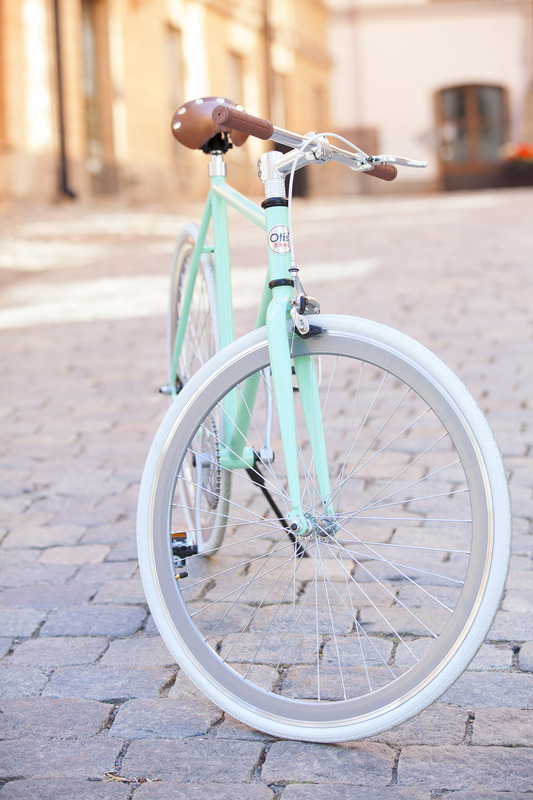 so in love with the minty green color of this bike and this is inspiring me to get out on my bike to explore more! Love the Otis bike. I am just starting college – what a fun experience that I could ride to and from class on and explore LA. Great color too. I wish I could hang my bike in my apartment! 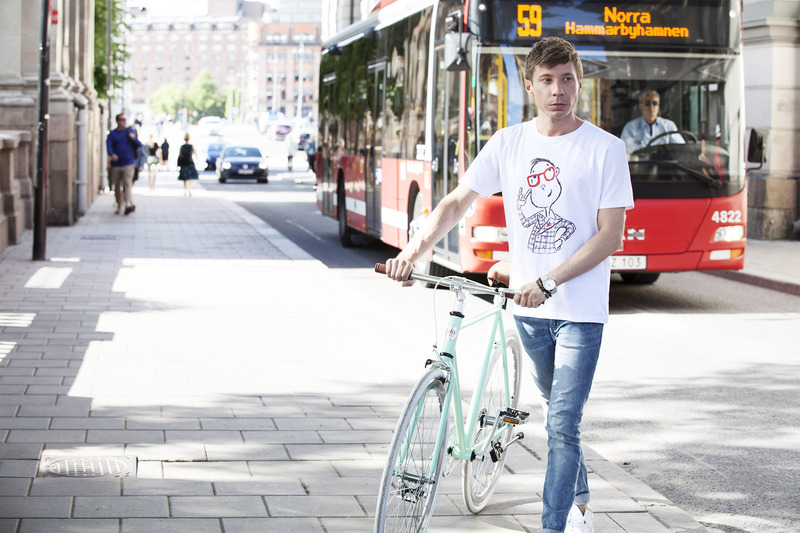 Love these shots, I didn’t get to enjoy Stockholm without snow but I’d love to bike around. OH, this bike looks so great. Thomas, this bike is so gorgeous that it’s basically a fashion accessory! I’ve found cycling to be such a great workout and wonderful for exploring new places. 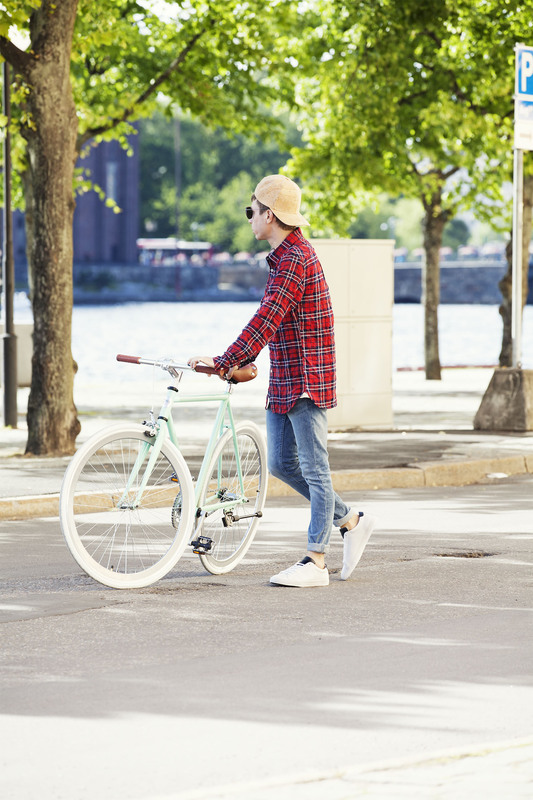 The photos you’ve taken with the bike really emphasize it’s fresh, pastel color, great job! That bike is absolutely stunning. 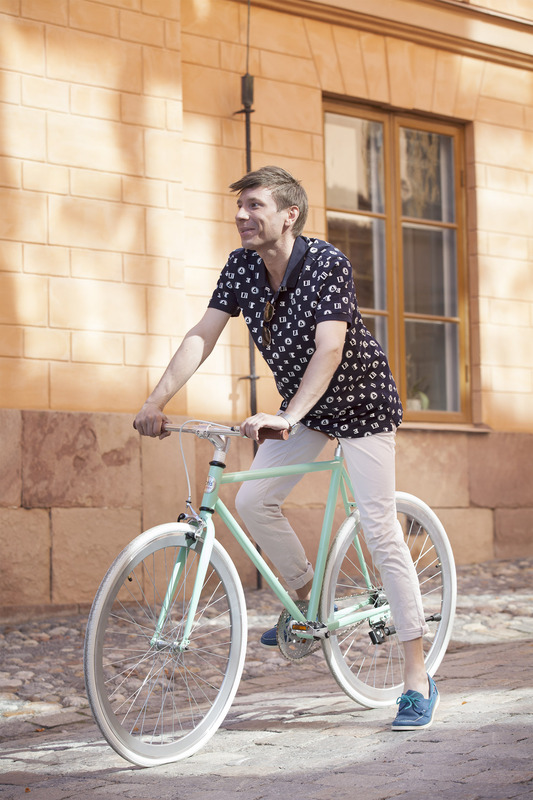 I love pastel colors too so you certainly made a great choice picking out this beautifully designed bike with such a fresh mint color. Speaking of your home town city, it is beyond stunning. I had pleasure visiting Stockholm just last week (thanks for a very, very special friend who took his time showing me around). I will definitely consider riding bike to explore that beautiful city even more when I visit again hopefully soon. By the way, I LOVE all the outfits you wore here in the this post as well. Enjoy your bike :). Oh my gosh, I haven’t gotten on a bike in like 15 years, well outside of a couple Spin classes, but that doesn’t count! I love the color of this bike and it’s basically another accessory! You had me at pastel colors! That was actually the first thing I noticed when I saw the bike. I love walking around and getting to know a city, but biking is fun too. My husband has bikes hanging everywhere but none that are that pretty in color! Glad you got to enjoy your summer and try something ”normal” between fashion weeks. SO FUNNY I actually did a really long walk from one neighborhood in NY to another and I told my fiance, we need to get bikes! Haha, not that the walk wasn’t enjoyable but it would have been so much faster and fun with bikes! That bike is really very pretty! I’m very tempted to get a bike now, even though I currently still hold the same fear you had of not being sure if you can still ride a bike! I haven’t been on a bike since I was 13. Well, since you’ve said the old adage is true, perhaps I’ll muster up the courage to give it a go again! I have always wanted to visit your city Thomas is definitely on my list. I have to say that I love ridding bikes and is such a fun way to explore a cool city. When I go to Amsterdam I also do the same and is great way to exercise too. Definitely will use Otis bikes if I ever come to your city!